As Trinity term draws to a close and vacation begins, it is time for another book display in the Sackler Library. 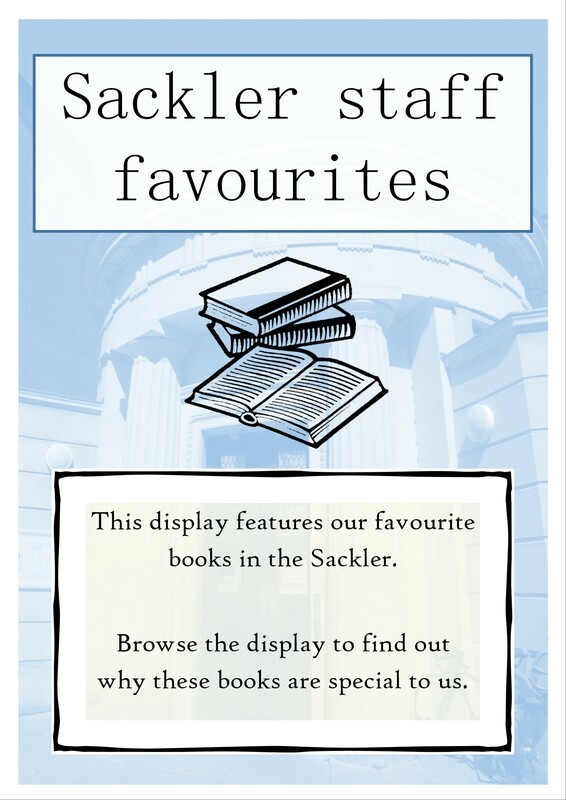 Previous book displays related to celebratory months and days (LGBT History Month and International Women’s Day), but this time I decided to try something different by asking library staff members to choose a favourite publication housed in the Sackler Library. This criterion was deliberately left broad so staff could choose any format of physical item (monograph, periodical issue, pamphlet, catalogue…) on any topic within the library. I also asked staff to write a few lines about why the book was important and/or special to them. The response was fascinating, with several library staff members immediately presenting me with their favourite book and sharing the story behind their connection with it. 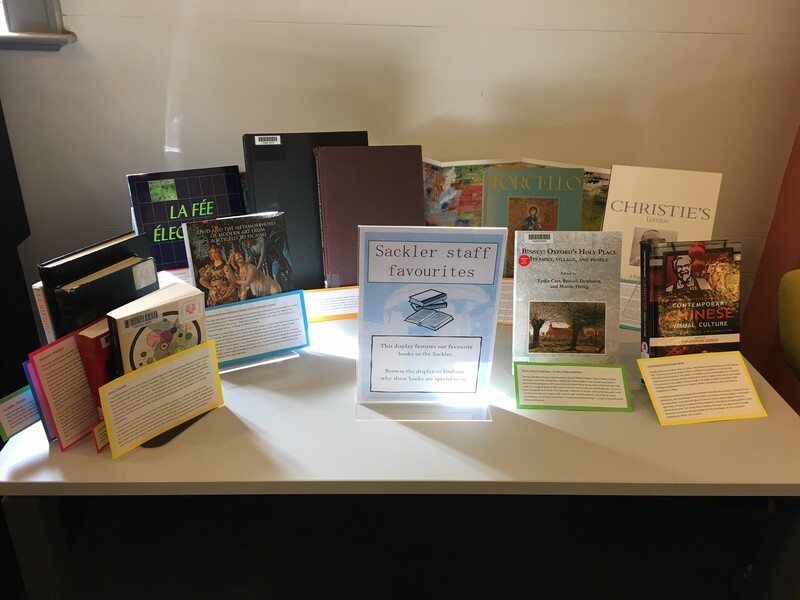 In the end, I have been able to display books chosen by a range of staff members, including reader services staff, subject librarians, supervisors and even our operations manager. There was a variety of reasons why people chose the books they did, but a couple of common themes emerged: books that were crucial to academic studies, and books that reminded people of a place that was special to them. As with previous book displays, part of the aim is to showcase different disciplines and areas of interest together in one place to spark interest and ideas in readers. The display is also a chance for readers to connect more with staff and to remember that we interact with and appreciate the collections here, too. Below is a list of the chosen books, along with the words written about each one. The books themselves are now on the display, each one captioned by the words people wrote to go with them. Some of these captions have been expanded here to tell the fuller story, and one or two should appear as full Like @ Sac! posts on the blog in good time. I have enjoyed hearing these stories, and I hope the readers will appreciate them, too, as they browse the display, which is located opposite the issue desk and will run for a few weeks. Aeschylus, & Fraenkel, E., 1962. Agamemnon, Oxford. “We are very lucky in the Sackler, as the set on the Lower Ground Floor was the one that belonged to Fraenkel himself. This gives our copy a unique connection to an important period in the history of Classics in Oxford. Eduard Fraenkel was a hugely influential figure: a refugee scholar (he lost his German university post as a result of the Nazi anti-Semitic laws in 1933) he was invited to Oxford, given an academic position, and later became Corpus Professor of Latin. He brought the German style of commentary on Classical authors to an English-speaking audience and his influence on Classical philology cannot be overstated. His ‘Agamemnon’ seminar became legendary; including in its alumnae the novelist Iris Murdoch, who wrote a poem about her experience, ‘Agamemnon Class, 1939′. By all accounts Fraenkel was both inspirational and terrifying (sometimes simultaneously). Fraenkel’s insistence on close reading, line-by-line and word-by-word interpretation, and his philological approach to the text set the precedent for the teaching of Classical Literature in Oxford for rest of the century (and beyond). Barolsky, P., 2014. Ovid and the metamorphoses of modern art from Botticelli to Picasso, New Haven. “The Latin epic poem Metamorphoses by Ovid has been a thread running through my studies (and interests) from school through to university final exams and beyond. Many of the stories told within the poem – Pygmalion, the fall of Icarus, Narcissus – are familiar to us today through various retellings in different media. Bayer, P., & Waller, M., 1988. The art of René Lalique, London. Berne-Joffroy, A., & Dufy, R., 1983. Zigzag parmi les personnages de la Fée electricité, Paris. “For a Francophile and fan of the artists of the “Fauve” movement there is no shortage of books to choose from in the Sackler’s collections. The “Fauve” artists’ use of brilliant colours, botanical themes, and paintings depicting bright Mediterranean seascapes glimpsed through open windows have always cheered and uplifted me since first discovering them during my undergraduate studies of French language and culture. It is very hard to choose one book and even harder to select a single painting but this small monograph dedicated to Raoul Dufy’s Fée électricité is my choice. The book contains a foldout at the back where the painting is reproduced in colour. Carr, L., Dewhurst, R., & Henig, M., 2014. Binsey: Oxford’s holy place; its saint, village, and people, Oxford. Christie, Manson & Woods., 2004. A peaceable kingdom: the Leo Mildenberg collection of ancient animals, Tuesday 26 and Wednesday 27 October 2004, London. “My favourite Sackler book is A peaceable kingdom: the Leo Mildenberg collection of ancient animals. It’s a 2004, London Christie’s Auction Catalogue. I first encountered it when Henry Kim, then at the Ashmolean’s Heberden Coin Room, said, “You’ve got to look at this!” He was right. This was at the very, very beginning of my DPhil, and though it was definitely going to be about animals in ancient Greece, I hadn’t yet decided if they would be snakes, or pigs (Boardman’s idea), or perhaps exclusively pets. At that point of indecision, and doubt about whether I was truly up to the job, this gorgeous catalogue gave me a bounce of delight that helped me into the next stage. During the writing of my thesis this ‘peaceable kingdom’ was a source of refreshment and supporting evidence, not only for study, but recreation too. A prancing cheetah on an Apulian red-figure plate (Lot 80) inspired an embroidered name tag, and the Mesopotamian leopard in limestone (Lot 153) was the focus of an intensive ‘lost wax’ silversmithing project. Both leopard and cheetah exemplify a charm and cheer that pervade the collection. They seem to reflect that of Mildenberg himself; delightfully pictured smiling throughout. Back at the Sackler, my colleagues love these ancient beasts too, even down to the issues desk stationery. Among our many novelty items, we have an eraser in the form of a faïence hippo that’s very like one of Mildenberg’s. The eraser is actually after ‘William’, the Metropolitan Museum of Art example, but whenever I see it, I think ‘Mildenberg’, and, funnily enough, Mildenberg named his too. ‘Hubert’ (Lot 111). Crouch, C., 2014. Contemporary Chinese visual culture: tradition, modernity, and globalization, Amherst. “Having spent my formative years in China, I was drawn to this title during a routine shelving shift. A discerning look at modern China’s contemporary aesthetic, it is at once both accessible and informative. The editor, Christopher Crouch, accommodates for a Western readership by providing a related reading list of texts in English at the end of each chapter. His command of the subject shines through in his ability to deliver a book that, whilst boasting contributions from over twenty scholars, still exhibits a clear and cohesive progression of ideas. Euripides, & Conacher, D. J., 1988. Alcestis, Warminster. Lister, R., & Palmer, S., 1988. Catalogue raisonné of the works of Samuel Palmer, Cambridge. “It was difficult to choose just one favourite book in the Sackler’s collection. In the end I chose a catalogue raisonné of an artist whose etchings I enjoy collecting and which was instrumental to my research and future interest in collecting antiquarian and contemporary prints. Lorenzetti, G., 1939. Torcello: la storia, i suoi monumenti, Venice. “This book by Giulio Lorenzetti, printed in Venice in 1939, contains black and white pictures and a folded map of the Torcello estuary showing obscure places which are familiar to me. Being of Venetian origins, I feel a mixture of pride and nostalgia every time I encounter something related to the small island of Torcello. From the Altino region on the mainland, the first “Veneti” were searching for a site where they would be safe from barbarian invasions. They chose Torcello surrounded by marshes which impeded enemies from reaching them by “terra o mare”, land or sea. This tiny island became the first Venetian settlement. Today its fewer than 20 inhabitants can daily enjoy the beautiful landscape in which Hemingway holed up while writing. They have the privilege of living near the Basilica Santa Maria Assunta, first built in 639 A.D. and containing wonderful mosaics to be admired on the west wall and the main apse. Two carefully protected colour prints of those mosaics are to be found inside the guide. Ancient storage facilities for the unloading and preservation of goods have been discovered on the island during archaeological work carried out in 2017, and continuing excavations are throwing new light on the early history of Torcello, which was the cradle of ‘the Serenissima’. Lucretius Carus, T., Rouse, W. H. D., & Smith, M. F., 1975. De rerum natura, Cambridge, Mass. Petronius, A., & Walsh, P. G., 1995. The Satyricon, Oxford. “The only preserved episode of this novel by Petronius was the lengthy scene of the dinner in Trimalchio’s house (Cena Trimalchionis). Trimalchio was a former slave who paid to be set free. He became this eccentric wealthy (and tacky) rich person who had all sorts of shows and displays within his house. Unfortunately his taste was very bad and the extravagant demonstration of his wealth transformed him into a caricature. On another level he is compared to Nero, as Petronius was alleged to be living in Nero’s court. The novel is a parody of Nero and his extravaganza, a parody of low morale and wealth display without any substance. The automatons and the shows that Trimalchio opts to bring within that dinner resemble the automatons and the machinery that Nero was keen on using (see the ship which would break open in the ocean and drown his mother Agrippina). On another level the usage of automatons and machines was a common practice of tyrants. Trimalchio (and subsequently, Nero), become the tyrants. This novel has set the foundations for all Western literature novels in the manner we know them now. The story of the Cena is actually a part of the adventures of Satyricon: Encolpius (the main narrator), Ascyltus (his lover) and Giton (Encolpius’s slave but a lover of both Encolpius and Ascyltus), are caricatures of the romance novel heroes. In the place of the traditional heterosexual couple who wonder across the seas in seeking their beloved ones, we have a homosexual couple plus their lover who go in adventures whilst seeking to find their beloved ones. It examines homosexual partnerships in a way that most literary pieces don’t. Plato, & Rowe, C.J., 2012. Republic, London. “I studied English at the University of Cambridge, but one of my favourite parts of the course was a paper in philosophy. Plato’s Republic – here translated by Christopher Rowe – is a fascinating insight into ethics, the concept of justice, and the ideal state. Plato likens the soul to a city, in having three parts: the appetitive element, the spirited element, and the reasoning element, which in turn can be found in the three types of people in a city. Ultimately, Plato decides, both the individual and the city must be ruled by reason in order to be just, but this conclusion has some uneasy implications for the largest part of the population.